Cook’s Illustrated senior editors Andrew Janjigian (left) and Lan Lam (center) at ATK’s new location. Since 1992, Cook’s Illustrated magazine — and, later, the food media company America’s Test Kitchen — operated from a narrow little brownstone in Brookline. It was more grandma’s attic than food media conglomerate: multiple floors, winding staircases, overflowing bookshelves, cramped rooms, quiet nooks. It was cozy the way your college library is cozy. But it was not particularly conducive to producing magazines, TV shows, and large quantities of food. And so, for the past two years, the media group has been casting about for bigger offices. America’s Test Kitchen (also known as ATK) now produces “America’s Test Kitchen” and “Cook’s Country” public TV shows; ad-free magazines like Cook’s Illustrated and Cook’s Country; radio shows; cookbooks; an online cooking school; and more. They’re known for fastidious product reviews, recipes, and as a trustworthy place to learn culinary basics. The first magazine issue taught readers how to roast a chicken. An early cookbook focused on pie-making. An upcoming one, “Cooking at Home With Bridget & Julia,” featuring “America’s Test Kitchen” hosts Bridget Lancaster and Julia Collin Davison, contains recipes for apple fritters and batter-fried chicken. But now there are more bells and whistles. This month, they moved their 230 employees to new headquarters at the Innovation and Design building on the fringes of the Seaport, about as far from a quirky Brookline brownstone as you can get. The 55,000-square-foot space — 15,000 square feet of cooking areas alone — is accessed through a massive freight elevator and laid out on one floor. Part of this seems fitting, though. America’s Test Kitchen always felt accessible, irreverent, and homey, like dropping in on your reassuringly geeky neighbor who had magical knife skills and who also knew just the best orange juice to buy and where. But the brand also needed to enter the modern era. In Brookline, says CEO David Nussbaum, it was impossible to shoot the kind of round-the-clock video necessary in today’s digital world. That had to change. “The office would need to shut down for weeks to film. People would film videos on Saturday due to space constraints,” Nussbaum says. Now there are warrens of storage space lined with Le Creuset cookware and Cuisinart mixers; a sprawling test kitchen where chefs no longer have to barter for workspace; and brightly lit studios with Wolf ovens where they can tape TV episodes, live Q&As, and video spots for social media whenever the urge strikes. 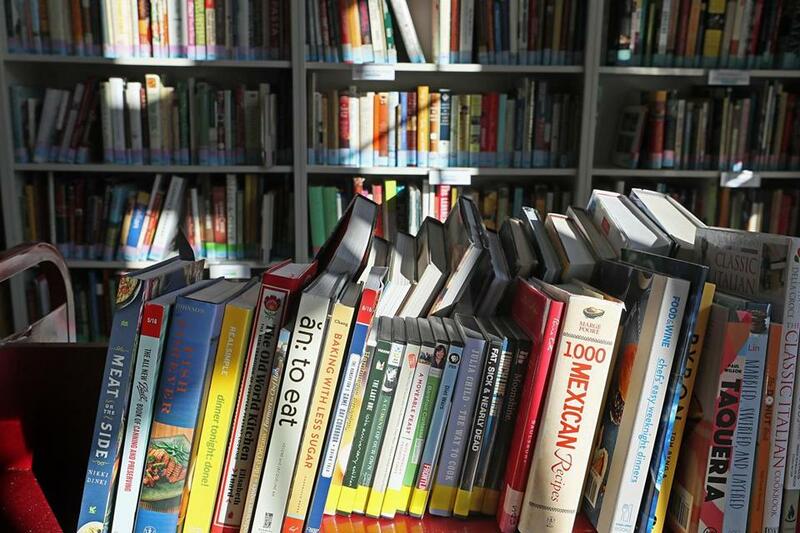 A portion of America’s Test Kitchen’s 4,000-plus-volume cookbook library. 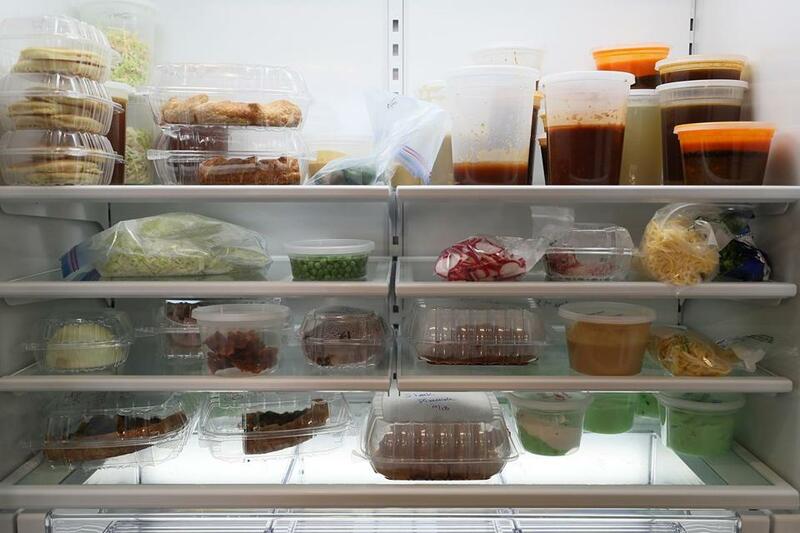 The space isn’t without its throwback charms, though, like a communal staff take-home fridge packed with delicacies like butternut squash galette and peanut noodles. Walls are painted a soothing blue and go from dark to light depending how close one is to the kitchen, which helps to orient confused staffers. (Some people joke that they use scooters to get around.) There is a 4,000-plus-volume cookbook library with tomes categorized by region and food, organized by library students from Simmons College. (If you’re looking for a multi-chapter exploration of herbs native, say, to the Pacific Northwest, this is your haven.) Conference rooms are named after ingredients and decorated with original Cook’s illustrations. Who wouldn’t want to take a meeting in the chilies room? On Oct. 27 and 28, ATK will throw a housewarming party of sorts. The ATK Boston Eats food festival isn’t your typical block party — some of Boston’s best-known chefs will cook alongside ATK’s staff. On Friday, TV personalities Lancaster and Davison host a recipe-tasting using local ingredients with chefs like Townsman’s Matt Jennings, Craigie on Main’s Tony Maws, and Doretta Taverna’s Michael Schlow. Attendees can also take backstage tours of the new headquarters (and ogle that mammoth cookbook collection) and sample dishes from basically every major restaurant in the city. “America’s Test Kitchen is ours. It’s emblematic; it represents us,” says Schlow. “This is another feather in Boston’s culinary scene. I love when they say, ‘We did this three different ways.’ They dispel old wives’ tales. There’s an educational component. And they deliver it in a fun, no-nonsense way. They have taken this weird mystery — what we do as chefs — and showed that great food is possible at home. As much as I like [people] to eat at restaurants, you don’t have to be a professional chef,” says Schlow. 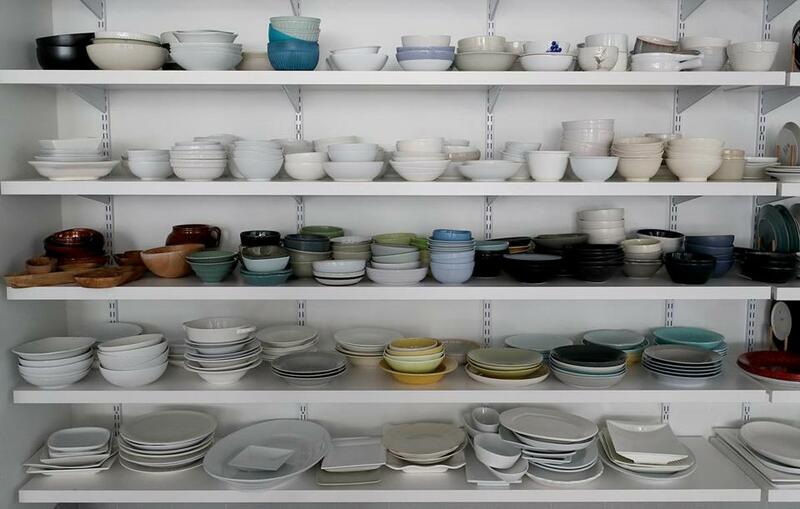 The 55,000-square-foot space has plenty of room for bowls. The event — and the move — is logistical but also symbolic. Chief creative officer Jack Bishop says that the number of employees has doubled in the past six years. And, for so long, they were marooned out in the suburbs. No more. America’s Test Kitchen is of Boston, and this is their coming-out party. It’s also an innovative time for the brand, he hopes. Last week, they announced a partnership with Sourcebooks to create America’s Test Kitchen Kids, a series of co-branded books for babies through teenagers to help children learn about food. Now there is a sprawling test kitchen where chefs no longer have to barter for workspace; and there are brightly lit studios with Wolf ovens. They’ll also launch a food truck in January, where passersby and Innovation Building denizens can sample lunchtime recipes and offer feedback. Customer input is a signature part of the Cook’s ethos, because the magazine is geared toward the everyday home chef. Test cooks typically choose a dish and then prepare five recipe variations of it; a Cook’s team then taste-tests. Next, the tester painstakingly finalizes a recipe, tinkering with different variables each time — cooking vessel, time, temperature, and proportions. (Souza says that it’s not unusual for a test cook to make a dish 60 times.) Once the internal team signs off on a version, a panel of volunteers called Friends of Cook’s Illustrated tests the recipe and fills out a feedback survey. If 80 percent of readers say they’ll make it again, it’s accepted for publication. If not, it’s back to the drawing board. Thanks to the new digs, these loyal readers can also take tours of the space. “We always had informal tours if people were persistent enough. Now you can sign up on our website, whether you’re working at the building or if you’re a fan who says, ‘Hey, we’re in Boston. Let’s check out Fenway and the Freedom Trail, and let’s stop by ATK,’ ” says Bishop. The move brings them closer to these landmarks — and also to Milk Street Kitchen, the downtown food media company started by Christopher Kimball last year. Bow-tied and bespectacled, Kimball helped to conceive America’s Test Kitchen. For years, he was the brand’s primary face and persona, while Bishop was his mellower foil. In 2016, America’s Test Kitchen sued Kimball. The complaint alleged that he built Milk Street — “a new venture which literally and conceptually ripped off America’s Test Kitchen” — by making use of confidential information from ATK, among other charges. Kimball filed a counterclaim. “The legal process proceeds at its usual pace,” Bishop says. But the mood on a recent visit to ATK’s city digs is festive. Photographer Steve Klise is celebrating a birthday. But because this is America’s Test Kitchen, after all, he isn’t eating birthday cake. Instead, his colleagues made him pancakes topped with ham, rib-eye, and bourbon caramel drizzle. “This is pure bacon grease!” someone cries. Bishop grins. The leftovers will end up in the take-home fridge. 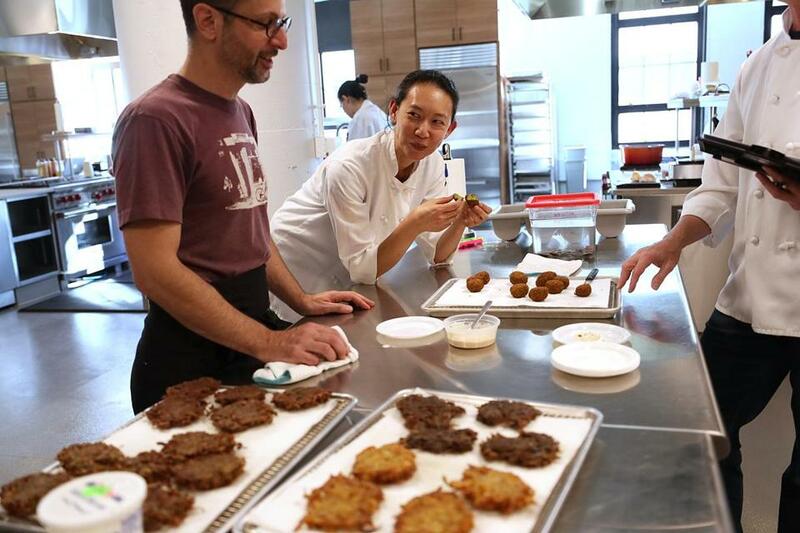 Elsewhere, senior editor Lan Lam is experimenting with purple potatoes and fashioning them into latkes. Test cook Steven Dunn is perfecting falafel balls with parsley, cilantro, cumin, cayenne, and coriander. People wander by and graze. Elsewhere, folks are sampling cornbread stuffing with sausage, which looks tasty but definitely needs more salt. That’s OK; it will go through several iterations before being deemed reader-worthy. Down the hall, associate editor Lauren Savoie has spent three days testing a cold-brew coffeemaker in a tastings-and-testings room. She appears remarkably calm for someone who has spent the better part of a week drinking caffeine. It’s this lovably industrious wonkiness that makes the company so suited to Boston, Bishop says. “The key trait that we look for at ATK in people [is curiosity]. It seems like a good way to describe Boston, in terms of very educated, passionate people who know their stuff. It’s a great place for us to find staff. We don’t take advertising. We don’t need to be New York,” Bishop says. “We obsess over details. It takes a good amount of time to find out why things work and why they don’t. We present that in a clear and honest way. I would never say we’re the sexiest company and brand, but I like that. I’m a New Englander, born and bred, and I like the pragmatic,” he says. And the modern now, too.